Eyecatching and strongly-scented, the deep violet flowers and palm-like leaves of this beautiful plant will add a tropical look to the late summer garden. 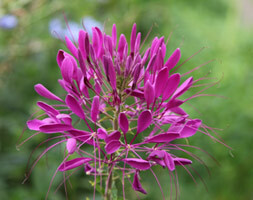 Great for adding vertical interest to a perennial border, the spidery flowers will also make attractive cut flowers. The seed heads can be dried and added to bouquets, too.